What if you could eat real whole foods that can trim your waist line and also improve your health? You can with what I consider to be my Top 5 of the best fat burning foods. In addition to being the building block of lean muscle, which is your body’s fat burning furnace, proteins thermogenic effect is 20-30% higher than carbohydrates. 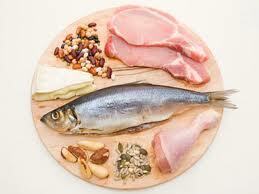 This means when you include a protein in every meal you raise your fat burning potential. Make sure to choose lean sources such as fish, eggs, chicken and turkey or a high quality low fat, low sugar protein shake such as our Ultimate ProFit. Scientists believe that people with certain kinds of unfriendly bacteria in their gut tend to get more calories from their food than others. We all have trillions of bacteria in our gut, some good some harmful. By adding good bacteria such as probiotics your body can naturally digest the excess calories more efficiently. Probiotics can be found in certain yogurts and kefir as well as supplements such as the It’sGreens . The most common plant associated with weight loss and one of the best fat burning foods! Green tea contains natural chemicals called catechins. Studies have shown that these chemicals increase fat burning and increase thermogenesis. Since it is difficult to control when brewed I recommend a supplement of green tea extract however adding the tea as well throughout the day will increase hydration and help control appetite. ItsGreens contains green tea extract as well as the Ultimate Thermofit and can be safely taken daily for maximum benefit. Spicy red peppers can be added to your favorite dishes or even slice and snack on throughout the day. Research has shown that chilli peppers can enhance metabolism however the side effects of the amount needed make it difficult to consume in its natural form. Most recently capsacin, a supplement form of the chilli extract proved safe and effective for weight loss. The Ultimate Thermofit uses capsacin as the catalyst that helps the body increase metabolism natural without dangerous side effects. Resveratrol-grape skin, blueberries, natural cacao powder- ALL in Ultimate ProFit! Getting a healthy serving of all of the best fat burning foods in your daily diet is optimal yet nearly impossible, certainly not affordable to all. To cover all your basis at an affordable price I recommend an Ultimate Profit Shake each morning with 2 scoops of ItsGreens , 2 ItsVital and 1-2 Thermofit for weight loss . It will do your body AND your waistline good!